As I am teaching my students virtually this year, it's become important to create a space where I can provide structured office hours. That space is Google+ and from noon to 12:30pm EST most every Friday, that's where I am. I am opening up that time to anyone in the professional teaching community to chat, brainstorm, and discuss issues in education and professional development. My only caveat is that if one of my students drops by the Google+ office, they get my full attention. Is there a place for 21st Century Technology in Baltimore City Public Schools? This is a stupid question. Of course, there is place for social media and digital technologies in Baltimore City Public Schools, maybe not that there is a place, but there should be - there has to be, and we, as educators and parents, have to make it. I have spent the last five weeks of my life in a class titled “The Paperless Classroom.” Day one I was told to make a Twitter, a freaking Twitter. At first I freaked out and I grasped for remnants of my pre-college too-cool-for-Facebook-MySpace-hating-self to justify my life up to this point. I was then forced to answer the question why? And I didn’t have an answer. For the next five weeks, I signed up for more digital media programs than I ever thought for a second existed. I found out that an entire universe of information was living all around me and that there were people who could breathe it, and I was suffocating. And today, maybe, I finally learned how to breathe in this world. I realized why all of this new media is important, what all this has led up to: I have created my digital soul. I have entered the digital age, and I am a more complete individual because of it. Yet, this digital world is being made inaccessible to our students. Why do we send our children to school, if we are not going to let them learn to breathe on the outside? If we send students to school to lock them up in a building, to take away their phones, to restrict them with web filters, to forbid our teachers from forming relationships with them, what are we teaching them? Nothing but to be afraid of the rest of the world, that the rest of the world and the digital universe are only there to hurt them. We are cultivating ignorance by fueling our students with disconnect and starving them with a lack of resources. Right now we have the opportunity to give students a global classroom, to connect them with the rest of the world, all of our history, and all of our future. If we don’t make changes and get our students connected to this digital world, we will leave them behind, without a chance of changing. Students in this city have enough problems when they start out, they are already dealing with things that no child deserves to face. How can we knowingly deprive them of the resources to make themselves better? Our students have the right to extend themselves and we have the responsibility to give them the tools to do so. To extend themselves they need to have an understanding of digital technology, they need to create and have an ownership of their digital soul. We need to start acknowledging the fact that what we do and experience digitally defines us just as much as the things that we do in our sensory life; that the comments we leave on a website, or photos we upload, are a digital record of ourselves - they are the ultimate journal, a record of our thoughts, saved universally, something that we can never loose, showing how we grow, and pending disaster, never erase. We need to embrace the fact that there is nothing wrong with this - we need to quit teaching our children to be afraid of this. The digital soul -- the record of ourselves and the redefinition of our personal space -- may be the most important advantage of social media and digital technology. But due to the culturally created fear and the resistance of our current school policies to change, we have limited not only our own lives but the opportunities for the success of our students. Unless we enable them to move into the 21st century classroom, we are locking them out of success in our rapidly changing world, we are leaving them on the wrong side of a rapidly rising wall - a wall that they can not even see. Baltimore City students see enough walls. We have to give them the tools to build a place in the digital universe where their digital souls can be just as real as the ones we see dreaming inside of them. We've debated Douglas Rushkoff's ideas regarding "Program or Be Programmed" on this blog before. Whichever -- and whatever -- way you feel about Rushkoff, the idea that kids would benefit from learning to program is an idea in and of itself long overdue in the edu mainstream. In my own experience, I still remember learning BASIC back in second grade as part of a computer science pilot program. That early introduction to programming gave me much more than the ability to write GOTO operations; it gave me a sense of how conditional operations function and thus impressed upon me early the structural value of logic. We've come a long way since BASIC, but for many kids programming remains something of a mystery. With this in mind, it put a smile on my face this morning to run across a @noblehour retweet of a mention by @edlioinc of the resources available at happynerds. Happynerds, the brainchild of Rails developer Michael Kohl, provides descriptions and links to a ton of kid-oriented programming learning resources for Windows, Mac, Linux, and even browser-based media. Happynerds began back in December 2009 and now features everything from Ruby for Kids to game design software. The original post explaining how the project started cites the inspiration of Railsbridge's "Teaching Kids" mission. Some very inspiring ideas both at Railsbridge and at Happynerds; it's well worth your time to check it out. Wondering - why is it that education is suddenly "Failing"? I keep wondering about this. Supposedly, public education in America is "failing". I don't understand how. We have changed how we do things in our classrooms and have all these online resources. Students can access information and help resources from their phones. So why are we "failing?" When I was in high school, we sat in a chair and took notes. We talked about books in English, studied historical events, did labs in science, and did tons of problems in math. We learned and we went off to college and did well. We had almost no support programs in the building. Now, as teachers, we differentiate, do projects, have students doing online enrichment work, have social workers, psychologists, tutoring and mentoring programs. Yet, students are apparently failing. We have "improved" education, yet we are "failing". I don't get it. We do all this "reform" yet nothing is changing. Of course, it could have something to do with the method of evaluating education being a mostly invalid, standardized test where even students who don't speak English have to take it. It could have something to do with more and more students having less parenting at home due to single parents, absentee parents, or parents working multiple jobs. It could have something to do with students not getting read to and starting to read later in life. It could have to do with the test being completely useless. It could have to do with professional educators being left out of decisions and planning for educational issues. It just boggles my mind how we have some many support systems, great teachers, incredible lessons and resources, and yet we are "failing." There are no free apps. I know, I know. Some of them don't cost a penny. I get that. But they aren't free. Not really. Corporations use "free" in order to sell something. Apple sells more products. Google sells more advertising. App-developers offer "free" with the goal of selling a nicer version. Often, freeware developers have a goal of selling customized consulting and IT development. Even open source comes with layers of cultural, social and political systemic thinking. Regardless of geography, every medium develops in a context and that context comes loaded with socio-cultural layers. There is a cost to every application. Sometimes it's environmental. Other times, it's social. But it always costs something. Perhaps we shouldn't be looking for "free" apps at all. Maybe we need to switch to a paradigm that says, "What is the cost?" and "What is the trade-off?" Perhaps instead of saying, "Is this free?" we need to ask, "Is this worth it?" Someone recently commented on this blog, asking if an innovative high school was simply a "minimum security prison." I'm not shocked by the comment. Lately, it seems that teachers have been compared to slave-drivers, prison wardens, thieves and child abusers. Yes, I've read about the industrial nature of schooling. Honestly, I agree that there are some real issues with compulsory schooling. But prison? Really? How many people who make that comparison have ever known a loved one who spent time in both? People can slam schools all they want. They can slam the system and complain about industrialization. They can make charts comparing the similarities (walls, cafeterias, lack of free movement, design, etc,) But just as I don’t oppose home learning (as opposed to homework), I don’t oppose an alternative method of education within the confines of the school. The social and cultural realities are that my students have parents who work two or three jobs and they simply cannot un-school or homeschool. I don’t get to choose my students nor do they get to choose me. We don’t get to chose standards, either. I can do documentaries, independent projects, murals, blogs and all kinds of learning that they find interesting. I can advocate a humane, meaningful relationship to replace traditional discipline. I can shift my pedagogy to problem-based and project-based. I can do away with grades and homework. I can encourage free movement. I can have honest dialogue that leads to small acts of liberation. Some would point to me and say that it’s simply a “minimum security prison.” And at that point, it’s not worth it. When we disagree on metaphors, it’s pointless to have a conversation. Maybe it is a prison. Maybe. But if it is, I would hope that a seed can grow under the industrial pavement and something organic is happening inside a place that is designed to be artificial. I would hope (and perhaps I am naive) that authentic learning can happen anywhere – even within the prison walls. I would hope that if we are stuck in a box, we can repurpose that box. If it is a prison, don't we need compassionate people working quietly to subvert it? Don't we need a few more Andy Dufresne bringing art and voice and beauty to a place that is so often at war against such things? As a teacher I find this type of learning exciting. We have an open filtering policy. Between the open internet and structure some students are a bit lost and off task at times as this is such a huge culture shift from the traditional classroom that they are accustomed to. I will not claim that we have this all figured out but I loved this moment of walking around and watching students work. I am fully prepared to be amazed at what students will do the next few years as they grow in our space. As part of the process of extending the digital conversation into the analog world, Shelly and I have been working to put together a local forum in Baltimore to discuss the future of education and technology. The first of the conversations will focus on using social networking to extend, enhance, and influence education. I will be moderating the conversation with Dave Troy (CEO of 410Labs, creator of Shortmail.com and Twittervision.com), Tom Murdock (co-founder and chief-architect of Moodlerooms) and Shelly Blake-Plock (blogger-in-chief here at TeachPaperless and founder of GrowConnected) as the panelists. The event will be this upcoming Tuesday (the 20th of September) between 6 and 8pm at Digital Harbor High School. We are looking into live streaming the discussion and tweeting it as well. Think of it as an analog parallel of #edchat. What topics would you want to discuss? What problems should they address? Make a comment below, follow us on Twitter (@EdTechBaltimore), visit our website (http://www.edtechbaltimore.org), join our mailing list -- help spread the word from the digital to the analog and back again. Sometimes innovation stems from just deciding NOT to do something. Have your desks in rows? Change it up. Let your kids set up the room the way they want. Find yourself lecturing too much? Don't lecture. Having trouble with the wi-fi? Take the kids out for a walk. Tired of the paper crush? Stop giving assignments that require paper. Pick something that's been bugging you about your teaching and do the opposite. Maybe something new will come of the decision to change things up. Maybe not. Maybe it'll turn out to be a big mistake. Maybe not. The only thing for certain is that you won't innovate so long as you continue to do the same thing you always do. What's Different? What's the Same? Looking for input from all of you, this afternoon. School's been back in session for most of us for a couple weeks and I'm interested in knowing "What's Different? And What's the Same?" at school this year. For me, it's very different. I'm teaching virtually and have been teaching from my dining room, a nearby cafe, a room at the public library, my car (I was parked)... right now we're using Tungle to set up online tutoring sessions. At the same time, working with kids is working with kids and even in the virtual realm much is the same -- from the humor to the concerns to the excitement to the doldrums. So do tell... how are things different for you this year? And how are they the same? What did I do during my week away from Twitter? Pretty much everything I do without Twitter, just with a little extra mind-wandering, more doodling and maybe a little less distraction. I didn't write more, run more or watch a foreign movie. Not much. I had the same types of conversations I have on Twitter, but I was limited by time and place. That Twitter is an everyday part of life. It's a place I like to be, but it isn't home. It's a method of communicating, but it's nothing as vital to me as blogging. Sometimes techies gush about social media as a transformative tool. This week reminded me that it hasn't transformed much of my life, much less my approach to teaching. It has, however, become normal -- and maybe the normalcy is precisely why it's powerful. When the novelty fades and I find myself drawn toward it again, I am reminded that the place/tool of Twitter has a place in my world. I will talk with 9th graders who were 4 or 5 years old at the time, about it a bit tomorrow. I am guessing they will have a few questions. But I will not teach about it. My own son who was born less than a month after that awful day asked me why they did it. My wife said it was because they hate us. But that is not the real answer, not a complete answer. The next obvious question is why do people hate us? Many would bring up religion, power, and economics. These are all part of the answer but the truth is so much deeper. The truth is that 9/11 is the result of a complicated story involving the United States, Europe, Israel, Russia, and the Middle East going back to World War II and before. It is a story of war, imperialism, greed, oil, hate, Cold War, and propaganda. There have been many innocent lives lost in this story, but there are no innocent nations. And the story continues in Afghanistan, Iraq, Iran, Palestine, and beyond. There have been many individual heroes and villains in this story, but the United States (unfortunately) is not the hero of this story but just another self-interested party. The story of 9/11 and the following wars in Afghanistan and Iraq is complex, messy, twisted, and historically based. It can not be summed up in a few words of a 5 minute YouTube video. What happened on September 11, 2001 was an incredible tragedy and I mourn with all of the families of victims this day. I will never excuse or defend the actions of the terrorists on that day. But the terrorists did not act for no logical reason (at least from their perspective). It is important that we understand the background of this story and their reasons for attacking. Only then can we decide an appropriate response to that day. Today marks the 10 year anniversary of one of the most important moments in our nation’s history. It also marks the 10 year anniversary of my first day of teaching. To turn on the television during the last week has been to be confronted with the networks’ attempts to help us figure out what 9/11 meant and what it continues to mean. I heard a story on Colorado Public Radio this week about a history teacher’s recollection of that day, companioned with his former student’s version. The former student was so inspired that ten years later he is a teaching candidate, enrolled in his former teacher’s methods class. Touching and inspiring stuff. 9/11 was my generation’s Kennedy assassination: we all remember where we were, what we were doing, what we were thinking and how we coped. All of us who were in the classroom that day dealt with something for which we were not prepared. I had first period planning and spent the hour before the first class of my career starring bewildered at the television while my coffee got cold. I tried to get more information on the internet but every news site had crashed from the traffic of a world full of people trying to do the same. I checked my email and saw a message from administration explaining that something had happened in New York City (We still didn’t know what...) and to please not alarm the students, several of whom had relatives who worked in or near the World Trade Center. I marched upstairs to my 9th grade World Literature class, guarding this enormous secret, and began my life as a teacher by posing my first essential question: What is art? With each anniversary, I think back and try to reflect on what happened that day. For me, the confusion and sadness of the attacks are inseparable from the fulfillment and inspiration I felt as I began teaching. While I cried every night as the details emerged and we learned that what had happened was no accident, I spent my days elated by the new experiences I found in education. In the Jewish faith, we celebrate a new experience by saying a prayer called the Shehekianu. It is our way of commemorating doing something for the first time. 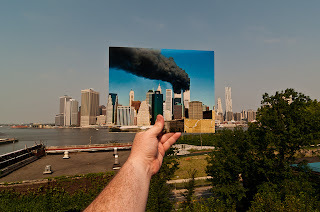 It is in this tradition that I memorialize September 11th each year. I seize onto all of the firsts, remembering them and being grateful for them. The first day of school. The first eager student to raise her hand, ask a follow-up question or show self-advocacy. The first activity that seems to engage the whole class. The first student to walk in after the bell or to use profanity. The first phone call to a parent. Whether it lifts your spirit or frustrates your soul, it is valuable at this time to honor and celebrate the firsts and to appreciate them for the meaning they provide us. Please leave a note in the comments. What firsts do you celebrate each new year? Technology is not making life easier. And the tools we use in the classroom do not make life easier. Going paperless won't make your life easier. Going paperless won't solve your problems and it won't "really" clear up that clutter on your desk. And I say, "Thank goodness." Because by striving to make things simpler, by striving to make things more manageable, we put ourselves in the mind-place where we might just wind up making the same sorts of decisions with regard to networked connections and personalization that led to the very things we hate about bureaucracy and standardization. We have to fight the inner urge to make our lives easier. Life is not easy. Neither for the individual nor for the society. Life is complex. It takes the ability to solve problems and the ability to face problems that can not be solved; it takes the ability to recognize both beauty and ugliness and to know that you can't have one without the other. We are living in an age of connections. That does not mean we are living in an age qualitatively "better" than any other. Technology itself is ethically neutral. And that is the way it has to be. Technology is not making life easier. We know this. Fundamentally, we understand that we are awash in an alien sea. And to we -- including myself -- who have stated at one time or another how simple a certain app makes something, or how much more manageable a certain device makes something: to hell with us. Life is not simple. Life is not something to simply be managed. Our kids get this. Our kids are still of an age where they aren't impressed by the technology they use so much as they are satisfied by it. We teachers are old enough to understand the shift in context and we therefore are amazed and at times overwhelmed. But few 15 year olds on Earth really care about how innovative Spotify is; the 15 year old just wants to listen to music. They don't want to celebrate the simplicity of the e-music revolution. They don't want to specialize in the management of audio data. They just want to rock out. To the 15 year old, Spotify -- and the whole of the technological vista -- is pretty obvious. And pretty simple. And yet not simple at all. Because what Spotify -- like the radio stations of our youth -- represents is one's identity. And there is nothing at all simple about that. And it is identity that our kids struggle with -- identity within the context of technology. And so there is really nothing simple about it at all. Nothing simple about it when you put it in the context of identity formation in a 24/7 connected pluralistic society. What's simple is just thinking about the matter from the point of view of technological innovation and dealing with the end result -- the product -- the user interface. And that's emblematic of the problem with technology in schools. We tend to think about technology in such a way that we divert our attention from the social aspect -- the formative aspect -- and instead look for the easiest-to-use user interface. So often we fall into a pattern of behavior that either obsesses over or ignores the interface because it seems to present itself -- and the "life" it represents -- in such an easy and simple way. But there is no simple way. And there never will be. And there shouldn't be. You can pull up the most easy listening Milquetoast music you could dream of on Spotify and it does nothing to diminish the complexity of the process that is bringing that music to you -- a process equally economic, technological, artistic, labor-intensive, political, and cut-throat competitive. It does nothing to diminish the social and psychological intensity of the process of identifying oneself culturally for or against an aesthetic. It does nothing to diminish the very life-stuff and joys and tragedies and wealth and poverty and salvation and abuse behind every note of music and every blip of byte to byte. We are teachers. And we know that when it comes to assessing the intellect and understanding of a student, there is no "simple". Technology itself will never do anything to change that. In fact, the power of personalized observation into formative development that technology does provide will probably only make the whole thing more complex. Maybe that's what we should be focusing on. Maybe that's what we should be calling this age -- not the Digital Age, but rather the Age of Complexity. ...and I am just getting the chance to shoot off a quick post about it. Lot's going on around here. I know my fellow contributors have been busy getting classes underway; I myself find myself starting the school year in a way that's new for me. That's because this year, I am teaching my high school students almost entirely virtually. I have been putting a lot of time recently into my professional development and ed tech pursuits -- such as the Baltimore EdTech Forum which will be on September 20th and will be an awesome beginning for a year-long conversation here in town on what the future of education and technology could look like for Baltimore City school kids -- and thus have been spending more time with teachers than with students. In a way, this is good; because over the years, I have seen my role developing into more of a facilitator than a "teacher" per se, and I am particularly compelled by being able to help other teachers do what they want to do. But I do think it is extremely important to keep one foot in the classroom, so as to have a daily reminder as to what this whole endeavor is about. And so, I've created what is the first virtual hybrid curriculum at my high school and I am very excited to see how things work out. I chose (and paid for) WebEx as our online meeting place (mostly because of it's ability to handle everything from PCs to iPads to phones seemlessly -- even students without smartphones can participate on-the-go via a traditional cellphone call); it's also way slick. I really love Edmodo and that's our place for assignments, calendars, grades, and everything else. For ongoing communication and news gathering we're using Twitter, and for quick chats we've got a TodaysMeet room staked out. I'm running "office hours" on Google+ using Hangouts. We'll see how that works. I think I'll post office hours for students and general Google+ Hangout time for general conversation among peers and colleagues both at school and with all of you. I am looking forward to fully step into this mobile world. Seems like a lot has happened since that day back in 2008 when I decided not to use paper anymore. On that note, I've caught some flack recently from people saying that by promoting online media over paper media I am helping to destroy the environment. Hmm. All I have to say is, yes, data centers and server farms are terrible for the environment; so are poorly recycled laptops and monitors. This is true. My hope -- idealist that I am -- is that the connections allowed through 1:1 Internet access will provide for people to develop new technologies that fix these problems; I tend to think we work better when we are connected and when we have access to the Internet. And real-time collaboration and the ability to search and share volumes of information worldwide is essential. In short, when it comes to tech, I think we work better and learn more when we base our commitment to education in the context of what's going on. It is true that technology can be dirty. It is true that technology itself isn't going to fix our problems. Technology really isn't a "tool" anymore. Technology is a context. Context produces culture. This happened before back at the dawn of the Industrial Revolution. The context of industry produced all sorts of pollutions and evils; it also produced the medical revolution and eventually gave lift to the social mobility of the lower and middle classes to attend colleges and universities. In the end, it was the decisions people made that -- both for much better and much worse -- shaped the century that was. Industry used to be the context; Digital is now the context; and yes, there are still so many connections between the two and so many assumptions we all make and so many places in the world where none of this seems to apply and so many places in the world where it all seems to apply. It's confusing. Difficult. It should make you uneasy. And excited. And nervous. And it could all be a mistake. And if the entire world collapses because of war, disaster, energy crisis, and famine, I am sure I'll be the one to blame <<< snarky alert! With any sort of technology there really is no easy answer. And therefore, I decline to offer one. Still too busy digging up questions. All that said, I just wanted to say "Thank You" publicly to all of the readers who make writing for this blog worth it. It's going to be a great year and I look forward to sharing with you all.